Positioned favorably within walking distance from the pulsating city heart thriving with the most popular shopping centres of M. G. Road and the prestigious administrative hubs of the district, Hotel Residency Tower offers an exceptional option of luxurious accommodation for the international tourists and the regional sightseers as well. The entirely renovated 4-star facility stands as the ultimate expression of comfort and luxury for the tourists and travellers in Thiruvananthapuram sited at the south gate of the Secretariat. Rated as a 4 star property by the Hotel & Restaurant Approval and Classification Committee (India), HRACC of Ministry of Tourism Government of India, The Residency Tower in Thiruvananthapuram features an extensive range of guest amenities and facilities adding to the popularity of this prestigious hotel in the city just 5 minutes away from the Thiruvananthapuram Central Railway Station and within easy reach of all major attractions of the city. With a wide array of recreational options across the facilities like the fitness centre and swimming pool, the sumptuous culinary experience obtainable at the Punjabi Restaurant named Dhaba and the multi-cuisine option known as Orion, The Residency Tower also provides all required conveniences indispensable for the business travellers in Thiruvananthapuram. A spacious living space and a luxuriously appointed bedroom are the most interesting features of the recently furbished Presidential Suites, which offer panoramic views of the entire cityscape across the extensive windows that run from ceiling to floor. The living area comes with a comfy two-seater sofa complemented with a trendy coffee table and a smart LCD television. The spacious bedroom is adorned with a king-size bed, two bedside tables on either side of the bed, a big LCD television and a separate workspace that is appointed aptly for official work. A spacious counter and bathtub are unique features of the marble bathroom, the toiletries being provided there as complimentary bath solutions. Luxury room amenities include 24 hour room service, in-room dining round-the-clock, remote-controlled air-conditioning, satellite channels, bedside access to the switching panel, free delivery of newspapers, calling options from room, wireless internet connectivity, hair dryer, socket for automatic shaver, mini bar, hangers, slippers, electric kettle for preparing tea/coffee and ironing solutions as and when needed. The deluxe rooms and executive rooms are embellished luxuriously with twin or king-size beds and two bedside tables, the spacious working area being furnished with writing table and chair. Natural lighting and scenic views of the city are available due to the presence of life-size windows at these rooms. The amenities appointed in the deluxe rooms are similar to those featured at the Presidential Suites, the only difference being the absence of the separate living space provided at these exclusive suites at The Residency Tower. The accessibility to Orion all round the day allows the guest to explore a wide variety of luscious international delights in a spacious setting that creates a celestial atmosphere. Specially arranged buffet menu as well as an ala carte option, inclusive of Indian, European and Asian delicacies, is provided during breakfast, lunch and dinner extensively only at Orion, which starts operating daily from 7 am onwards. Lunch can be enjoyed between 12.30 pm and 3.00 pm whereas dinner is served between 7 pm and 11.30 pm. Oozing out a charmingly cozy feeling, the Dhaba serves authentic Punjabi cuisine at the on-site terrace garden of The Residency Tower, daily timing for dining being 7 pm to 11 pm. The lobby area also accommodates another tempting option for relaxing and unwinding, the coffee shop is open for the guests at The Residency Tower morning and night. In-room dining, any time, is another comfortable option for enjoying food at this prestigious 4 star facility in Thiruvananthapuram. Over a decade The Residency Tower in Thiruvananthapuram is serving not only the holidaymakers with exhaustive options for leisure activities but also taking care of the specific need of the diligent business professionals with a 24-hour business centre equipped fittingly with a wide category of corporate solutions. Spacious facilities for banqueting and conferencing at The Residency Tower comprise of Galaxy, Planet, Nova, Board Room and Pool Side. The spacious banquet hall Galaxy accommodates up to 550 guests for meetings and functions whereas the smartly appointed conference room holds up to 75 persons at a time. Nova serves up to 60 guests at a time during meetings and other events while the boardroom provides space for a maximum of 25 corporate guests. The Pool Side is a very charmingly adorned banqueting facility by the turquoise waters of the swimming pool at The Residency Tower serving up to 50 guests at a time during receptions and banquets. Rs. 1960 is the standard tariff for the deluxe and executive rooms at The Residency Tower, which is not inclusive of the fees and taxes. Taxes are levied separately upon the room rate. 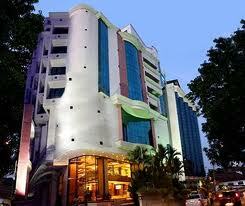 This tariff is available especially for online room reservation at The Residency Tower inclusive of breakfast. Daily Rate with complimentary breakfast is charged up to Rs. 5500, which does not include fees and taxes. Reservation is eligible for cancellation when it is done before 48 hours of occupying the room. Full payment needs to be deposited for not turning up or late cancellation. Guarantee on credit card is essential for payment, which is to be deposited using credit card. Press Road, Trivandrum - 695001, Kerala, India.